Merced, CA (August 8, 2018) - The biggest thing in towed water sports is making waves for the 2019 model year with new features, options and the same World Championship surfing performance. As the newly crowned market share leader in the 26-foot segment, the Centurion Ri257 continues to blow minds with the World’s best surf waves. This retail growth is thanks to a long wave with tons of push and a full spectrum of sweet spots from curl to face. This surfing phenomena is created by the Opti-V Hull, 5550 of ballast, 7 specifically placed ballast locations and 90-second filling RAMFILL ballast. The Ri257 has all the advantages of a big boat in waves, wakes and ride with uniquely better handling and 50% more fuel efficiency. Numbers like these have earned the Ri257 the title of official towboat at the 2018 BoardCo Rocky Mountain Wake Surf Open for the second year. The Ri257 also continues as the Official Pro and Outlaw towboat for the World Wake Surfing Championship presented by GM Marine going off in Ogden Valley, Utah at the Pineview Reservoir, September 6-8, 2018. This year’s Centurion WWSC stands to pile on to the 58 World Championship personal bests behind the Ri257. Visit your nearest Centurion Boats dealer and let us prove to you that we’ve got your number with the perfect ride of the Ri257. The Ri257 has a newly refined look for 2019 with redesigned Core, Drive and Surf gel coat schemes. These vibrant schemes no longer hide beneath waterline and they have been fine-tuned to make more of an impression even at a distance. The new All Hex vinyl option adds another level of customization to this already uniquely built boat. Now bring more color and texture into the interior of your 2019 Ri257 to match your personality. Centurion boats is a custom boat manufacturer and there is no boat that is a better example of that fact than the 2019 Centurion Ri257. The 2019 Centurion Ri257 towers above the rest with the new optional DropZone Auto Tower by Roswell with available BombShell Strapless Racks and XXL Bimini. This new tower folds quick and smooth with the push of a button thanks to floating Linear Actuators. The DropZone offers even more function with thoughtful touches like surf-side tow points and hangers. It also provides 40% more strength thanks to the water drop extruded construction that compliments the lines of Centurion boats perfectly. It looks as though the DropZone with BombShell Strapless Racks were designed exclusively for the Centurion Ri257 because they were. In sports, the sweet spot is everything. Other boats have one sweet spot – a position, typically off the back of the swimstep, where there is a constant push. The Centurion Ri257 offers a spectrum of surf able power from the curl all way up to the face of the wave. This helps beginners learn to throw the rope, as well as seasoned pros master their next World Championship-winning move. 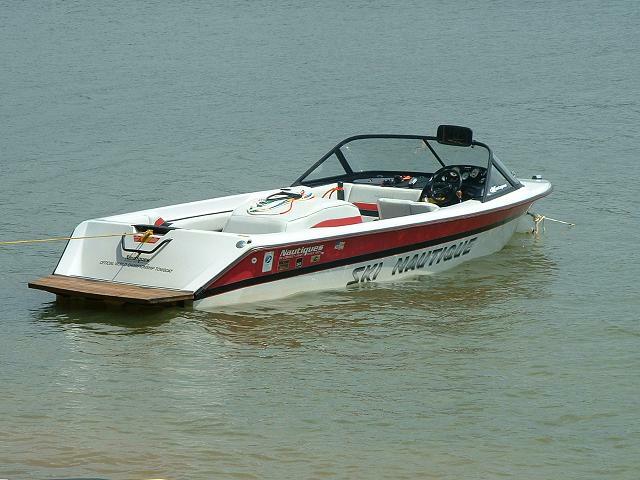 This is why the Centurion World Wake Surfing Championship is at 58 personal bests during the competition and counting. The Centurion Ri257 surf sweet spot is as much as 26 feet – more of a sweet surf spectrum than a single spot. This “World’s Best” wave is the result of purpose-filled numbers and we’ve got yours. Centurion’s Opti-V hull design displaces more water, to form the world’s best waves quickly on either side and creates side-to-side balance for perfectly symmetrical wakeboard wakes. With 20 degrees of deadrise at the transom, as much as double the degree of V as any other towboat, Centurion’s Opti-V Hull eliminates the shock of rough water for an amazingly smooth ride. Centurion has the World’s best waves, wake and ride. Centurion’s Opti-V hull is so efficient, even with 20-degrees of deadrise, it cuts through the water with minimal resistance. This is thanks to strakes, chines, rear hull pads and wave enhancement systems that create lift rather than drag. The results? Up to 50 percent more fuel efficiency than comparable boats of other brands. Adding to the performance and efficiency of the 2019 Ri257 is Centurion’s exclusive RAMFILL ballast. This system is comprised of two sub-floor tooled-in tanks extending from the driver’s seat back to the transom of the boat. These tanks fill with as much as 2650 pounds of water in as little as 90 seconds. That’s a minute and a half to deliver exactly the wakes you want, whether beginner or seasoned pro. Over a ton of weight in less than two minutes and wakes can be adjusted mid-session. Just as important as the speed at a which these tanks fill and their weight is their location. They are evenly distributed through the center of the boat helping to eliminate a nose-high running angle and adding to the efficiency of the Opti-V running surface. Centurion offers the industry’s largest and best-placed ballast capacities. Depending on the model, you can get up to 5550 pounds of displacement. That means you have the flexibility to dial in the waves and wakes you want. It’s a simple formula: more specifically placed ballast = better waves and wakes. 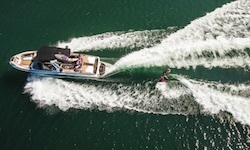 With as many as seven precisely placed ballast locations independently controlled at the dash, Centurion boats create pro-level waves and wakes that can be fine-tuned for any riding style. The proportional front-to-back ballast locations also allow the driver to level the running attitude of the boat for increased visibility and improved handling. All of this performance will be proven behind the 2019 Centurion Ri257 at the World Wake Surfing Championship presented by GM Marine in Ogden Valley, Utah at the Pineview Reservoir, September 6-8, 2018. Ask your local Centurion Boats dealer how you can secure a spot for the Water Prove It VIP Experience at WWSC 2018 and take advantage of the largest buying incentive of the 2019 model year.